Alleged Benchmark of the ”Kaveri” Flagship the A10-7850k have surfaced on the webs. The benchmark is a single image file and reveals the alleged performance of the Steamroller cores in Kaveri, ie. CPU Performance. Conveniently it is a Cinebench Bench (redundancy!) so we can see real life comparisons with other counterparts. These benchmarks were picked off of Overclok.net Forums and have not been refuted as of yet. However do take these with a pinch of salt. 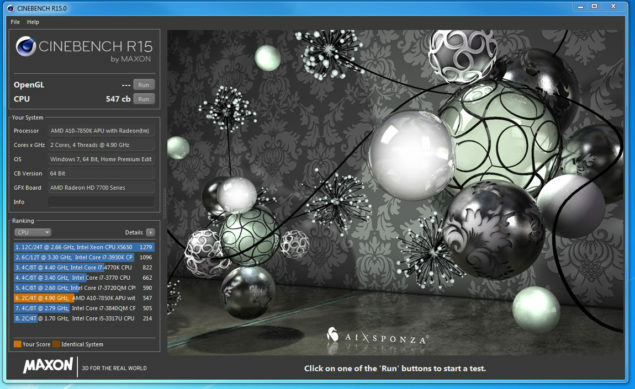 Basically these show the real life performance measured in Cinebench’s latest release (R15). The “Kaveri” A10-7850k APU with 4 Cores achieves a CB Score of 547. This is exactly middle of the Intel i7-3720QM and the Intel i7-3840WM. 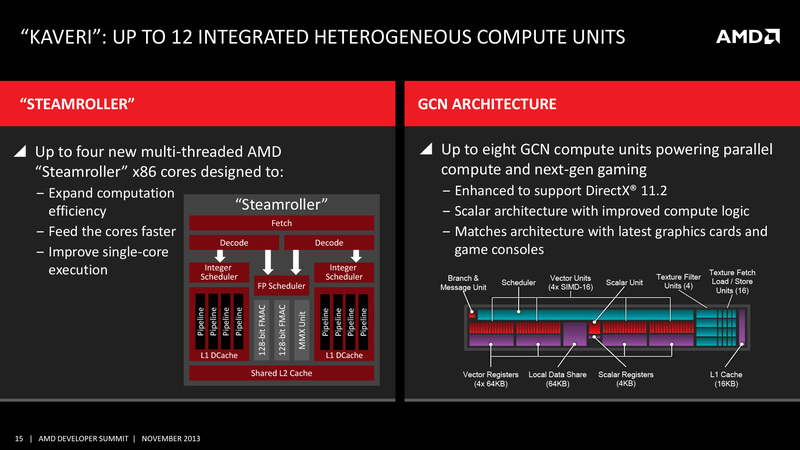 However the important factor to be noted is that in this league most CPUs have hyper threading with 8 Threads or so. The reason its showing 2 Cores and not 4 (of Kaveri) is probably incorrect detection due to non-official support and also one of the reasons we think its not fake. (Fakes are perfectly shopped). Something similar happened with Richland benches as well. AMD processors have always been clocked very high relative to Intel Counterparts. It is because of this that clock rates are never directly comparable. We can see that the sample scores provided by Cinebench are dominated by the 24 Threaded Intel Xeon X5650 that has a score of just 1279. However the thing that i am truly interested in is the fact that the Haswell processor, ie. the i7-4770k. The Haswell processor leads by a margin of ~275 CB Points and considering the fact that it has twice the threads as the ”Kaveri” APU that is expected. It would have been a much fairer test if the user (whoever it was) had benched the 4770k with Cinebench’s thread restriction option. Ofcourse i am assuming that he had access to one in the first place (the score given is a sample). Also AMD has already stated that they will loose against Haswell. One of the obvious reasons is ofcourse that bieng an APU Kaveri has to devote its die space for a good gpu too. However where on board graphics are concerned AMD looks good. Leaked slides already show a decent lead over i5-4670k. The price and previous gen comparison are given here and here respectively.